After researching on a prototype, the HELIOtube solar thermal system has been installed in a mushroom production plant to test its operation in an industrial environment during a year. Following this period marketing, which has already generated some conversations, will be assessed, as Vita Aurea has explained to us. Heliovis AG, an Austrian company, in collaboration with the Spanish companies Vita Aurea S.L. And Villarus SL. built the first HELIOtube equipment for exclusively investigative purposes at the end of 2012 in La Solana, Ciudad Real. “It was meant to test a solar thermal system at investment costs much lower than the current ones in real conditions,” notes Vita Aurea in a statement. The investment for this prototype amounted to 1 million euro and no State or Community aid was requested. The land was rented by the la Solana town hall and the prototype was dismantled in the summer of 2015 at the end of the research. 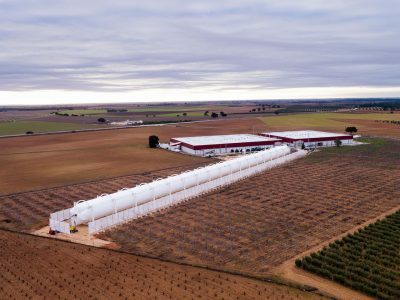 Given the positive results of this research, they decided to build a second one for industrial use in Villalgordo del Júcar, Albacete, which will produce energy for a mushroom production plant for Mercajucar Sociedad Cooperativa. The equipment installed has 220 meters of length and 10 meters of height with a power of 1 thermal MW. The energy produced will be used to partly replace diesel and pellets currently used. The total cost of the investment amounts to more than 3 million euro. The European Commission has allocated aid of € 2,632,932, through the Horizon 2020 Program for Research and Innovation. The system consists of a PVC, ETFE and reflective PET film cylinder. This last film, which has an area of ​​1,600 m² reflects the heat of the sunrays and at the same time divides the interior of the tube into two totally separate chambers, the statement explains. A small difference in pressure between the upper and lower chamber results in the surface of the reflective sheet being inflated so that the rays are concentrated on a glass tube with a liquid, heating it to a temperature ranging between 230° and 300°. The heat generated heats a tank with 30,000 liters of water at 95 ° C used to heat the chambers in which mushrooms are harvested, they continue. The biggest advantages lie in costs and ease of installation compared to other methods of solar thermal energy collection through parabolic mirrors, as well as the capacity of recycling all components without impacting the environment, says Vita Aurea. The opening ceremony will take place on Friday, June 23 at 3:00 pm in Villalgordo del Júcar. The Ambassador and the commercial adviser of Austria will be present. The Commissioner for Research, Science and Innovation of the EU, Carlos Moedas has confirmed his attendance in principle. Commissioner for Action for the Climate and Energy, Miguel Arias Cañete has also been invited.